I am passionate about rabbits and rabbit welfare and feel that this forum will help to provide better lives for our bunnies, as we can share our collective knowledge. I currently have three of my own bunnies (soon hopefully to be 4), and three long term fosters -who belong to fellow mod Buddabun (Helen). I am minding them whilst she lives in Brunei for a few years! 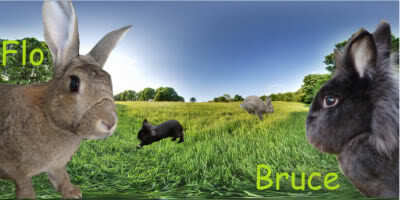 I am keen to learn all I can about rabbits, in order to better the lives of those, whose welfare I am responsible for. I also like to spread the word in order to improve the overall quality of life, of as many rabbits as possible. I am here to learn and share as much as I can! I am very pleased to be a moderator here and will be happy to assist any of you with any queries, questions or issues you may have. I am a moderator for Happy Hoppers and believe it or not I too am passionate about rabbits! I currently have three UK bunnies (being fostered by Catswhiskas a.k.a. Charlotte ) and four more bunnies who live with me in Brunei. I couldn't bare to rehome Charlie, Jack and Brian and so Charlotte was good enough to bunny-sit for a few years until we can be reunited! I am always keen to 'spread the word' on bunnies as I feel they are overlooked as a pet and mistreated far more than any other pet. Especially here in Brunei, where animal welfare is not a top priority. I am more than happy to pass on to anyone and everyone the knowledge I have gained over the years and will do my best to help in any way I can. As of today I am pleased to announce that Jay has joined the moderation team as a full-time Moderator, moving up from his previous position of Forum Ambassador. Ooh, Jay is moving up in the world! Hi, I'm Jay and am thrilled to be a HH moderator, after being a Forum Ambassador for a while. I have one house bunny, Bertie, who is just the funkiest thing on 4 legs Like many of our members, I have a wish to make the life of the domestic bun a better one, and have learnt alot from Bertie since his arrival. My interest is in recreating natural environments and stimuli for him to be as rabbity as he can be. I also make the videos for the HH You-tube channel. I have also learnt so much from the experience of the members, and hope that as a moderator, I can help the team promote and support the forum, and its members, in the positive, cordial and harmonious way that it has evolved. Today I am sad to announce that Buddabun is no longer part of the moderation team on HH but we would like to offer her our warm thanks for the great work she has done over the past three years, and we hope she will still be around from time to time as a member of our community. NickieM will now be taking on a full-time Moderator Role. Today I am pleased to announce that NickieM is joining me as a full administrator on the forum and will therefore also have a final say on all matters regarding the forum and members conduct in my absence. This means she is no longer a moderator. Congratulations! Your name is all lit up in red! I know it looks so bright and strange. Wow! Congrats Nickie, as soon as I signed on I noticed your name was a different colour. Very cool! Well, hello and welcome to all of you. Joining this site is one of the best things I have ever done and being bunny mad, it is lovely to have friends who feel the same and are happy to advise if there is a problem. I think the club is great now and I look forward to hearing all about friends' bunny and seeing lots of photos. Apart from Mr Snuffles my bun who is 8 years old, (a black and white lop), I have two hammies, two cats, a tarantula called Fluffy, 4 guinea pigs, 4 baby snails and 6 hermit crabs and I live for all of them. Congrats Nickie, I've just logged on today and seen your name in red! As of today, I am pleased to announce that Katieb has moved up to the role of Moderator. I know she will continue to do a fantastic job supporting the running of the forum from her new position as she did in the time she served us as a Forum Ambassador. Hi there my blue friend. This means you are officially a smurf! I was going to ask her if she was feeling blue! The little known "bunny slave" smurf ! NickieM wrote: Hi there my blue friend. This means you are officially a smurf!